Floyd Landis shadowed every move, riding the long and strong pulls by Rabobank's Michael Rasmussen and Michael Boogerd into the race lead. Denis Menchov made their efforts pay, taking the stage win, his first. Levi Leipheimer took 2nd on the day, ahead of Landis. Landis becomes the 5th American in yellow, riding a steady hard tempo, rather than taking an explosive stage win. Landis admitted that he would have preferred to take the jersey later in the game, but as he said, you can't turn down a chance at the yellow jersey. T-Mobile showed its strength early, cracking the field over the Col du Portillon, but team leaders Andreas Klöden and Michael Rogers were dropped on the day's final climb. Davitamon-Lotto's Cadel Evans and CSC's Carlos Sastre did better, only faltering in the last kilometers, and finishing only 17 seconds behind Menchov. Menchov, at 1:01, emerges as the biggest threat to a Landis overall victory. Evans sits at 1:17 and Sastre at 1:52. Klöden, Rogers, and everybody else are more than 2 minutes down, with a long time trial scheduled for Stage 19. Michael Boogerd was incredible at the front of the select group, but the day's revelation was Marcus Fothen, who controls the white jersey competition, 12 minutes ahead of Damiano Cunego, and sits 10th overall. It looks like Discovery Channel may have no leaders, not four as previously suggested. Jose Azevedo was the best placed Disco rider, 4:10 back, while Popovych was at 6:25, Hincapie at 21:23, and Savoldelli at 23:04. T-Mobile takes the team lead back from AG2R. Dessel goes from two jerseys to none, as Saunier Duval's David de la Fuente takes over the King of the Mountains lead, with 80 points to Dessel's 62, Wegmann's 61, and Rasmussen's 49. 3) Floyd Landis, Phonak, USA, s.t. It will be a double-Dekker squad at the Tour for Rabobank, which will introduce budding superstar Thomas Dekker to the Tour, riding alongside 12-time Tour rider Erik Dekker. Denis Menchov is showing excellent form, taking the stage to the top of Mont Ventoux during this month's Dauphiné Libéré. He'll have help in the mountains from last year's King of the Mountains, Michael Rasmussen. There are stage wins all over this team: Erik Dekker has 4, Freire, Boogerd, Rasmussen, Juan Antonio Flecha, Pieter Weening (nipped Klöden on Stage 8 last year); and that doesn't even mention Menchov's Vuelta championship (when Roberto Heras was DQ'ed) or his white jersey at the 2003 Tour. Spain's Roberto Heras has been banned for two years for EPO. Heras, who tested positive while riding for a record fourth Vuelta a España win last year, is considering whether to appeal to Spain's cycling federation or directly to the Court of Arbitration for Sport in Switzerland. "We need to study the decision carefully to see where we will take the appeal," Buxeda was quoted as saying by Spanish daily El Pais (link in Spanish). "If we take the case to the Court of Arbitration for Sport it will take at least five months for a resolution." 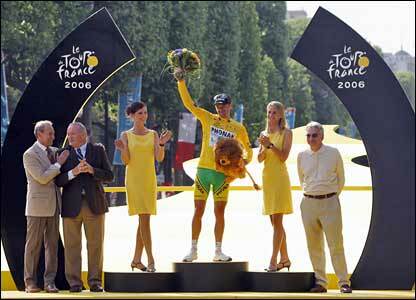 The finding hands the 2005 Vuelta title to Denis Menchov of Rabobank, who finished 2nd overall. Heras, of course, insists he is innocent. "I never doped myself," he said. "I didn't do it during the Vuelta nor at any other time. I've always won cleanly. I can't allow all my sacrifices to be trampled due to an error. I have to take the result on board, but I question it." Basso, Leipheimer, Valverde, and Rasmussen all sit closer to the race lead than they did yesterday. They had the best days for riders not born in Texas. Unfortunately for them, they're not chasing down Jens Voigt from here on out. First rider to drop out on the day was Lampre's Gerrit Glomser; he's the 16th rider out, leaving 173 in the race. An opportunistic break was allowed to get 13:30 out in front; the biggest name and highest placed rider to make that break is Laurent Brochard, the former world champion, sitting 49th, 7:58 back this morning. Brochard, of course, has the peloton's worst mullet. So much for "making CSC control the pace": Discovery is still doing most of the work on Cormet de Roselend. Discovery looks to be performing to expectations: Their pace is sending more than just pack fodder off the back: Iban Mayo has fallen off, and yellow jersey Jens Voigt is at the back of the lead group. Beltran is doing the pacemaking, and even Padrnos is still in the lead group, shadowing Voigt. Brochard's group is 4:45 up the road from Armstrong, Ullirch, Leipheimer, Landis, Pereiro, Julich, Moreau, Vinokourov, and others. Voigt has yo-yoed off the back of the lead group and rejoined. Over the top of the Col de Roselend, Pereiro attacks, and is joined by Jorg Jaksche of Liberty Seguros. The Brochard-to-big guns gap is 3:43 at the summit. Popovych crashed on the descent, apparently with a team car, but got a new bike, and is chasing back onto Armstrong's group. Looks like he hit CSC's team car, and may have tangled and lost with the front fender of one of Discovery's Subarus. The peloton has grown as riders dropped on the first climb chase back on. Discovery is still doing all the pacemaking. Jaksche and Pereiro have caught the break, which is now composed of Brochard (Bouyges), Jaksche (Liberty), Pereiro (Phonak), Luis Sanchez (Liberty), Gianluca Bortolami (Lampre), Mauro Facci (Fassa Bortolo), Yuriy Krivtsov (AG2R), Inaki Isasi (Euskaltel), and Joost Posthuma (Rabobank). Pereiro started 5:12 behind Voigt this morning. Discovery has brought back everyone from the early break except Jaksche, Pereiro and Brochard, and it won't be long on those three. Roberto Heras and Denis Menchov are toasted and off the back. Mayo reportedly likewise, Beloki is off the back. CSC finally is making a move, sending Sastre off the front. Discovery lets him dangle off the front, but he doesn't have the legs to go. Guerini off the back, Moreau off the back, Vladimir Karpets off the back. Horner off the back. Julich off the back. Botero off the back. Five Discovery riders up front. Only about 20 riders in total still in contention. Sastre falling off this group, paying for his attempted break. Leipheimer, Vino, Landis, Ullrich, Basso all are still in Armstrong's group. Valverde is also there. Discovery has started to pay for the pace; Popovych is the only Discovery left. Vinokourov is back at the back of the group of 16 riders; Mancebo is there. Vinokourov is dropped! T-Mobile has Klöden and Ullrich up front. Popovych is popped, and IT'S ON! Armstrong blows the group of 14 into a group of 5 or so: Armstrong, Basso, Valverde, Rasmussen, and Mancebo! Goodbye, Klöden, Ullrich, Leipheimer, Julich, and Landis. They've still got 10 kilometers to ride! One of the most entertaining web Tour de France reports is The Daily Peloton's Jambon Report, where they award their Golden Hams and Ham-gazers to the riders who ruled and drooled, respectively, during the day's stage. Today, Locutus has their GC preview up. Some highlights: he thinks Chris Horner "is the team leader, and the team just doesn't know it yet", expects Brad McGee to take the prologue-that's-not-really-a-prologue on Saturday, and thinks Ullrich will lose serious time on the first major mountain stage, as he does every year. Tyler Hamilton pulled out of the 2004 Tour de France on the same day his foundation is sponsoring a big-screen viewing of the stage to Plateau de Beille. "I'm still not 100% since the crash last week. The legs are just not turning right," said Hamilton. In his absence, his Phonak team's ambitions look set to be headed by Santos Gonzalez, who is ninth overall. Also dropping out today was Haimar Zubeldia, Iban Mayo's teammate on the Euskaltel-Euskadi team. Zubeldia was 5th in last year's Tour, and had been suffering from a knee injury. Also also dropping out was Denis Menchov of Illes Balears-Banesto, who won last year's white jersey for the best rider 25 and under. Menchov finished 7th yesterday, but also had knee problems. "I had the perfect team, I have no excuses. It's just unfortunate I had the accident." "It's a sad day. I've never dropped out of the Tour. When they mentioned it this morning that I should do it, it wasn't even on my mind." Hamilton said he just can't use his lower back on climbs, and couldn't see the purpose in continuing with no likely role in the race. After three riders gapped the field with about 6 miles to go, 2003 Tour white jersey winner Denis Menchov crossed over to the three — Floyd Landis of US Postal, Samuel Sanchez of Euskaltel-Euskadi, and Dave Bruylandts of Chocolade Jacques — then took the 4-man sprint at the line, aided when Landis threw a chain in the final hundred meters. "One of the things that helped me achieve this was the fact that I hadn't really worked that hard for most of the day," the 26-year-old Russian said afterward. "I quietly stayed in the peloton so that I could approach the end of the stage in a relatively fresh state. As I felt good, and I remembered the course a bit from the Tour de France last year, I thought I'd try my luck." "It's not over even if I think that today was the most difficult," said the German. "I fear above all Sunday's stage, the last day. Vandenbroucke is getting stronger and stronger, and I would have liked to have a bit more of a lead on Rebellin." CSC remains bunched atop the standings, with Jaksche first, Bobby Julich 3rd at 42 seconds, and Jens Voigt 4th at 46 seconds. Among the non-CSC riders, Gerolsteiner's Rebellin is 2nd at 14 seconds, US Postal's George Hincapie is 5th at 48 seconds, then Frank Vandenbroucke is 6th at 58 seconds.